Michael Symon is one of my favorite chefs and I'm completely hooked on the show he's on: The Chew on ABC. I've tried a few other recipes from the show, savory ones, but hadn't actually tried one of his recipes until last night. Wow, was I missing out. These cookies are AMAZING and shockingly simple (as most really good recipes are). Now, the photo below is not one I took. Not because my cookies didn't turn out, but because the photo I took of them made them look less-than-appetizing. It was a pile of brown cookies...I think you can make your own assumptions on what they looked like in photographic form on my less-than-stellar camera! 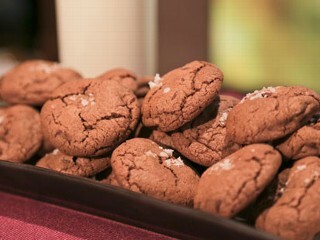 Check out the recipe for his Chocolate Chocolate Chip Cookies with Sea Salt and let me know what you think! I actually followed this one exactly and didn't change a thing.